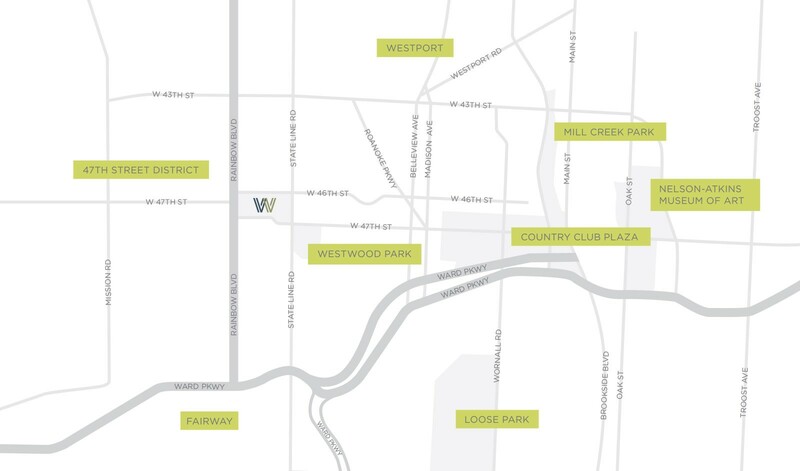 Woodside Village is in the city of Westwood, positioned perfectly in the middle of Kansas City’s most vibrant communities. Living here puts you in the center of it all. Whether you’re looking to live close to loved ones or need a taste of city life, it’s all just minutes away. Walk mere blocks to Kansas City’s most iconic area. With a rich history, and year-round calendar of music and special events, there’s always something to explore. Enjoy the city’s most premier shopping, dining and entertainment. More fine establishments are just a short trip down Rainbow Road. Ride your bike for some ice cream in the summer, or spend some time perusing the shelves at the local bookstore in Fairway. Loose Park is one of KC’s most popular parks. At 75-acres, the park was the site for the Battle of Westport. It has a running trail, rose garden, play area, pond, bridges and plenty of history to take in. Minutes away from Woodside Village, Westport is a fusion of local eateries, fashionable boutiques and hot night-spots. Kansas City’s original entertainment district is an ever-evolving place to eat, drink and shop. One of the city’s most prized attractions for art and culture is just moments east of Woodside Village. With traveling exhibits and fantastic permanent collections, the world-class museum is open to the public year-round. (Oklahoma) Joe’s Kansas City Barbecue may be one of Kansas City’s most famous landmarks for foodies. Located just blocks from Woodside Village, 47th Street now boasts some of KC’s most up-and-coming flavors. You’re just a jog away from Mill Creek Park. Located on the east side of the plaza, Mill Creek Park is popular place to run and exercise, or just enjoy a stroll around one of Kansas City’s most distinct landmarks, the J.C. Nichols Fountain.